Keeping another generation farming may drive some people to drink. That’s certainly been the case for the Manhattan, Montana, Droge family. But the seed potato, small grains and pulse crop farmers aren’t imbibing the spirits, they’re distilling them. It all started as a brothers’ night out joke. Every Tuesday, Tim, Terrence and Jeff would have a meeting of the minds and talk would often turn to the piles of oversized waste potatoes culled from their seed potato market. The standing jest was the extras should just be made into vodka. “I think every potato farmer has made that joke,” Jeff says. The Droges, however, followed through. Jeff and his wife, Erica, started pursuing the idea of using distilling to add value to their waste potatoes which, due to the variety, were otherwise only suitable for cattle feed. After much research and many family meetings, they attended Moonshine University, an intern distilling course in Kentucky. Jeff Droge checks the proof of a batch of vodka. Erica and Jeff returned from their experience inspired to turn a long-standing farmer’s jest into a reality. Erica serves up Dry Hills Vodka to Jeff, Tim and Terrence at their tasting room. Opportunity. Schultz kept pushing as he saw an untapped market. He spent time in Europe where eating and drinking local is a centuries-long standard. Each town had their own wine, beer and spirits. Why not bring the only missing factor of that local equation, local spirits, to Montana? His passion and work opened doors for other would-be distillers. 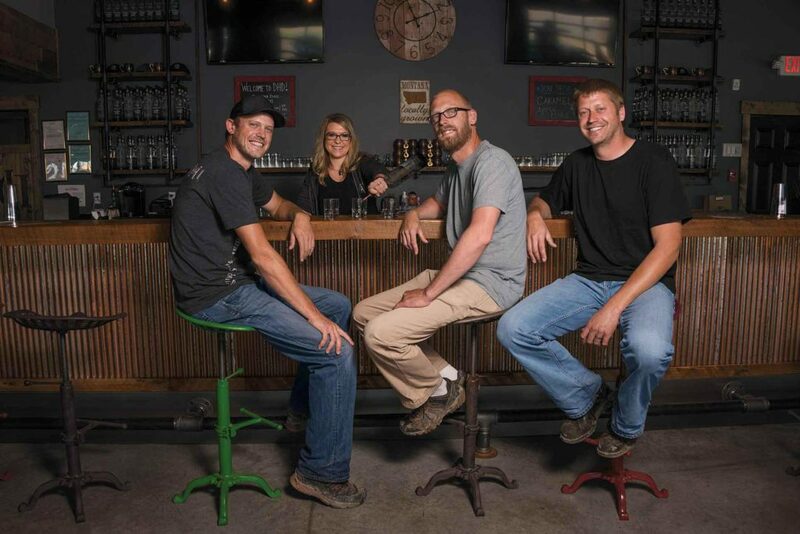 Erica and Jeff devoted countless hours to developing a business plan, securing financing and getting their distillery and tasting room built in nearby bustling Bozeman. 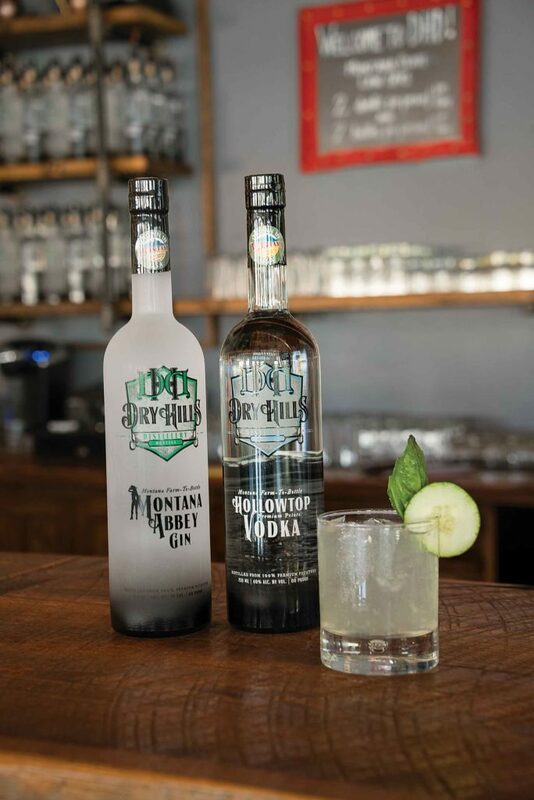 In 2015, Dry Hills Distillery, named after the region their family homesteaded five generations ago, got the go-ahead to transform waste potatoes to spirits. It didn’t all go down smooth as a potato-based vodka, though. Mash production was a trial. “We worked with Headframe Spirits, bringing them whole potatoes to process in their high shear mixer. They thought it would take 5 minutes. It took a full day,” Jeff says. They then tapped a fellow producer who makes hash browns to cube the potatoes first with better luck. They refined their plans accordingly and secured a Montana Growth Through Ag grant to buy the necessary peeler and dicer. 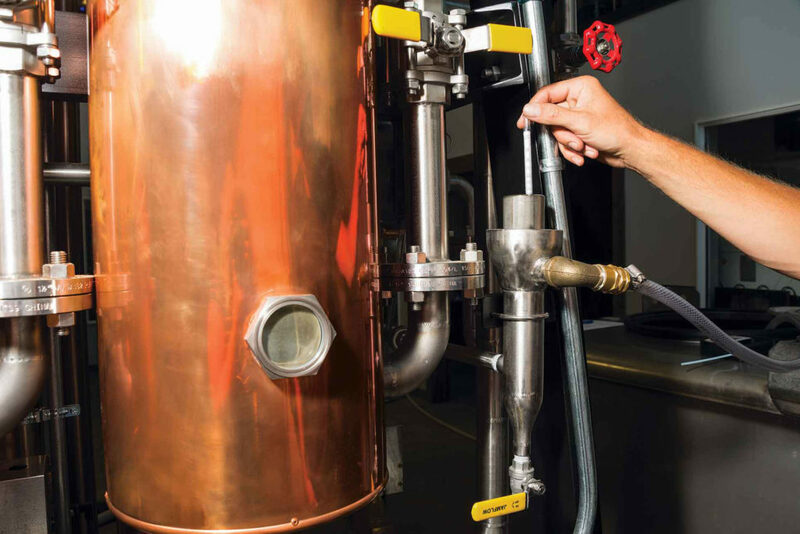 The Droges are distilling Montana’s first and only farm-to-bottle potato spirits. Potential. While Erica and Jeff have taken lead on the spirit business, Jeff’s father, Glenn; Terrence and his wife, Calette; and Tim and his wife, Amber, all work to keep up farm production, are investors in the distillery and provide counsel along with Erica’s parents, K.C. and Karen Barnhardt. They’re excited about the future. They’ve branched out into whiskey, using hard red spring wheat and are looking at their other crops, too.